Cockayne syndrome (CS) spans a spectrum that includes Cockayne syndrome type 1, the classic form; Cockayne syndrome type 2, a more severe form with symptoms present at birth (ie, cerebrooculofacial-skeletal [COFS] syndrome, Pena-Shokeir type 2 syndrome); Cockayne syndrome type 3, a milder form; and xeroderma pigmentosa–Cockayne syndrome (XP-CS). The discussion in this article is limited to Cockayne syndrome types 1 and 2, also termed Cockayne syndrome types A and B, respectively. Cockayne syndrome type 1 (CKN1; Online Mendelian Inheritance in Man [OMIM] number 216400) and Cockayne syndrome type 2 (CSB; OMIM number 133540) are rare autosomal recessive disorders that feature growth deficiency, premature aging, and pigmentary retinal degeneration along with a complement of other clinical findings. Cockayne syndrome type 2 presents at birth, whereas Cockayne syndrome type 1 appears during early childhood. CKN1 was first reported in 1936. Fatality usually occurs in early adolescence, but some patients survive until early adulthood. Premature aging is the cardinal feature of both types; however, within the first 2 years of life, growth and development become abnormal. By the time the disease has fully manifested, height, weight, and head circumference are far below the fifth percentile. The characteristic physical appearance of cachectic dwarfism with thinning of the skin and hair, sunken eyes, and a stooped standing posture illustrates the aging process. Pathologic studies reveal diffuse and extensive demyelination in the central and peripheral nervous systems. Patients demonstrate pericapillary calcifications in the cortex and basal ganglia at an early age; severe neuronal loss in the cerebral cortex and cerebellum also occurs. These changes correlate with the physiologic changes of aging. Incidence is less than 1 case per 250,000 live births. Patients are at risk for postnatal growth failure, pigmentary retinal degeneration, and premature death before adulthood. Postnatal growth failure: Profound growth failure begins within the first year of life. Weight is affected more than length, and cachectic dwarfism results. A rare subset of patients, classified as having severe CKN1, have low birth weight with almost no postnatal growth. Pigmentary retinal degeneration: This diagnostic criterion for CKN1 (salt-and-pepper appearance in the retinas) develops later in life. Cataracts are the second most common eye finding. Premature death: The characteristic appearance of aging in children with Cockayne syndrome is striking. The mean and median age of death is 12 years, and most patients die as a result of pneumonia or other respiratory infections. 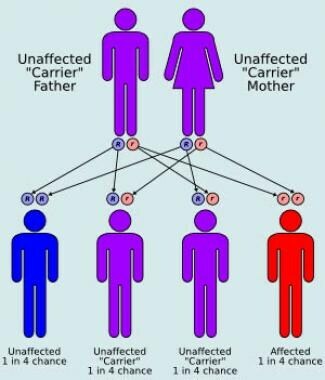 Male-to-female ratio is 1:1, which is consistent with an autosomal recessive disorder. The pattern of autosomal recessive inheritance is illustrated in the image below. As a progressive congenital disorder, clinical symptoms may not be manifested until late infancy or early childhood. Kubota M, Ohta S, Ando A, et al. Nationwide survey of Cockayne syndrome in Japan: Incidence, clinical course and prognosis. Pediatr Int. 2015 Jun. 57 (3):339-47. [Medline]. Wilson BT, Stark Z, Sutton RE, et al. The Cockayne Syndrome Natural History (CoSyNH) study: clinical findings in 102 individuals and recommendations for care. Genet Med. 2015 Jul 23. [Medline]. Khayat M, Hardouf H, Zlotogora J, Shalev SA. High carriers frequency of an apparently ancient founder mutation p.Tyr322X in the ERCC8 gene responsible for Cockayne syndrome among Christian Arabs in Northern Israel. Am J Med Genet A. 2010 Dec. 152A(12):3091-4. [Medline]. Laugel V, Dalloz C, Durand M, et al. Mutation update for the CSB/ERCC6 and CSA/ERCC8 genes involved in Cockayne syndrome. Hum Mutat. 2009 Nov 5. [Medline]. Zhang H, Gao J, Ye J, Gong Z, Gu X. Maternal origin of a de novo microdeletion spanning the ERCC6 gene in a classic form of the Cockayne syndrome. Eur J Med Genet. 2011 Jul-Aug. 54(4):e389-93. [Medline]. Cao H, Williams C, Carter M, Hegele RA. CKN1 (MIM 216400): mutations in Cockayne syndrome type A and a new common polymorphism. J Hum Genet. 2004. 49(1):61-3. [Medline]. Chien YH, Chou HC, Hwu WL. Cockayne syndrome in a family. Acta Paediatr Taiwan. 2002 Jan-Feb. 43(1):46-9. [Medline]. Cleaver JE, Thompson LH, Richardson AS, States JC. A summary of mutations in the UV-sensitive disorders: xeroderma pigmentosum, Cockayne syndrome, and trichothiodystrophy. Hum Mutat. 1999. 14(1):9-22. [Medline]. Greenhaw GA, Hebert A, Duke-Woodside ME, et al. Xeroderma pigmentosum and Cockayne syndrome: overlapping clinical and biochemical phenotypes. Am J Hum Genet. 1992 Apr. 50(4):677-89. [Medline]. Higginbottom MC, Griswold WR, Jones KL, et al. The Cockayne syndrome: an evaluation of hypertension and studies of renal pathology. Pediatrics. 1979 Dec. 64(6):929-34. [Medline]. Kleijer WJ, van der Sterre ML, Garritsen VH. Prenatal diagnosis of the Cockayne syndrome: survey of 15 years experience. Prenat Diagn. 2006 Oct. 26(10):980-4. [Medline]. Lehmann AR, Francis AJ, Giannelli F. Prenatal diagnosis of Cockayne's syndrome. Lancet. 1985 Mar 2. 1(8427):486-8. [Medline]. Mathur R, Chowdhury MR, Singh G. Recent advances in chromosome breakage syndromes and their diagnosis. Indian Pediatr. 2000 Jun. 37(6):615-25. [Medline]. Moyer DB, Marquis P, Shertzer ME, Burton BK. Cockayne syndrome with early onset of manifestations. Am J Med Genet. 1982 Oct. 13(2):225-30. [Medline]. Nance MA, Berry SA. Cockayne syndrome: review of 140 cases. Am J Med Genet. 1992 Jan 1. 42(1):68-84. [Medline]. Proops R, Taylor AM, Insley J. A clinical study of a family with Cockayne's syndrome. J Med Genet. 1981 Aug. 18(4):288-93. [Medline]. Rapin I, Weidenheim K, Lindenbaum Y. Cockayne syndrome in adults: review with clinical and pathologic study of a new case. J Child Neurol. 2006 Nov. 21(11):991-1006. [Medline]. Ren Y, Saijo M, Nakatsu Y, et al. Three novel mutations responsible for Cockayne syndrome group A. Genes Genet Syst. 2003 Feb. 78(1):93-102. [Medline]. Sugita T, Ikenaga M, Suehara N, et al. Prenatal diagnosis of Cockayne syndrome using assay of colony-forming ability in ultraviolet light irradiated cells. Clin Genet. 1982 Sep. 22(3):137-42. [Medline]. Traboulsi EI, De Becker I, Maumenee IH. Ocular findings in Cockayne syndrome. Am J Ophthalmol. 1992 Nov 15. 114(5):579-83. [Medline]. Venema J, Mullenders LH, Natarajan AT, et al. The genetic defect in Cockayne syndrome is associated with a defect in repair of UV-induced DNA damage in transcriptionally active DNA. Proc Natl Acad Sci U S A. 1990 Jun. 87(12):4707-11. [Medline].